MLS 2018: Can Toronto FC Aim For a Back to Back MLS Cup? The Reds completed an unprecedented Canadian treble last season, winning the Supporters' Shield, MLS Cup 2017 and Canadian Championship in what will go down as one of the most dominant campaigns of all time. Toronto FC finished twelve points clear of their nearest rivals in the league standings, scored 74 goals and recorded the highest number of points in a regular season. 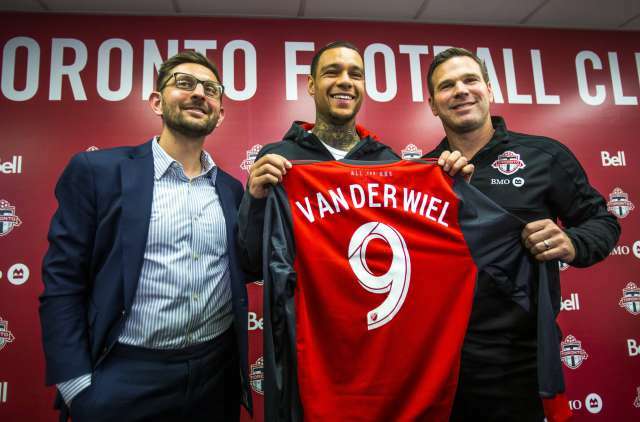 The core of the team have remained in Toronto, and head coach Greg Vanney will again be at the helm, so is it so unreasonable to suggest that FC will go back to back? We don't think so. While they will certainly face stiffer competition in 2018 (let's face it, everyone will be looking to take down the reigning champions), we can guarantee they will be in the playoffs at the bare minimum, and history shows us they know how to reach the final once they make it that far. While Toronto still have the opportunity to make a few more signings, there has been precious little movement in this department, meaning that the majority of the side that made back to back MLS Cup finals will be in action once again. As you can see, Toronto FC are not losing any of their main offensive weapons. The retirement of 36-year old playmaker Benoit Cheyrou is not a shock, although his presence in the midfield was vital during the club's recent dominance. He will stay on in an Academy role. Steven Beitashour made 55 appearances at the back for Toronto FC since he moved to the club in 2016, and he will leave a gap at right back, while the other notable loss is Raheem Edwards from midfield. The list of players in is much smaller, although they all appear to be calculated buys. Patterson-Sewell comes in as a direct swap for Mark Pais as a potential backup goalkeeper, while Academy and second-team prospects Akinola and Fraser will come in to bolster a midfield and defence that is lacking in numbers. Gregory van der Wiel is undoubtedly the biggest signing, and will slot straight into right-back to replace Steven Beitashour. He has a wealth of European experience, making 130 appearances for Ajax and 89 starts for Paris Saint-Germain between 2012 and 2016. His lack of recent game time is a minor concern, although he should be more than capable at the back in Vanney's system. Auro is an exciting prospect and will be likely used as a backup full back in case one of the older boys breaks down or doesn't work out. He is known as a right back, similar to van der Wiel, so it will be interesting to see where he is utilised. Toronto also secured four picks in the draft, although none of the players have been promoted to the first team. With so few changes, the starting lineup for Toronto FC in 2018 shouldn't be too different from the side that won the MLS Cup final in December, although the 4-4-2 utilised by Greg Vanney on that occasion is likely to make way for his preferred 3-5-2 setup. The 3-5-2 could also be referred to as a 5-3-2, although the attacking positioning of the wing-backs makes them more midfielders than defenders. Bono came into the side after number one Clint Irwin suffered a hamstring in the opening match of 2017, and he has held down a place in between the sticks ever since. Bono was instrumental in the team's great defensive record last season, and will surely be seen as first choice again in 2018. Morrow has barely missed a game since he arrived from the San Jose Earthquakes in 2014, and has come along in leaps and bounds playing in a role that allows him much more offensive freedom. His fifteen goals for the club are an indication of his ability. We think van der Wiel will have the first crack at the role on the right, although young Sao Paulo loanee Auro will compete for this position. The Dutchman has plenty of experience in Europe, and will surely adapt quickly to the MLS. Mavinga has been given the green light ahead of Nick Hagglund at times during 2017, and he is probably seen as the stronger of the two. Eriq Zavaleta is now one of the first names on the team sheet, while Drew Moor is as solid as ever. His age may begin to become a factor in the next year or so, meaning Hagglund will likely see plenty of game time. The captain and the rock. Bradley's performance in the final three postseason matches were clinical, and with him on the park the opposition never look like getting a decent chance. His ability to break up the play makes him the best in the league in his position, and there's still a few years in the old boy yet. Jonathan Osorio is an unlucky omission from this pairing, and could easily get just as much game time as the two listed above. Victor Vasquez is the standout performer of the trio and his link up with the strikers makes him very dangerous. He has also scored a number of important goals for the Reds, and his inclusion in 2017 is arguably the reason why Toronto were able to go one step further and win the MLS Cup. Marky Delgado was recently called up to the USA men's national team, and at just 22 is certainly a future star. He is less of a goal threat but just as potent in the centre of midfield in terms of output and pass completion. Not much needs to be said about these guys. Both are absolutely critical to their team's success, and the match Toronto FC played in Columbus while both were suspended showed just how much their attack relies on the pair. Giovinco scores as many goals from set pieces as he does from general play, and it's quite astonishing just how often he slots one right into the top corner from a free kick. Altidore is just your typical brute-force striker, playing in the same style as a Romelu Lukaku or Andy Cole. His strength on the ball makes him the perfect foil for Giovinco, who can run off him and score. The Key Question - Can They Go Back To Back? TFC were phenomenal last season, and the only complacency is in the way of a remarkable second consecutive MLS Cup victory. The Reds started slowly in 2017, with a lengthy road trip causing them a few headaches, yet once they got going they never looked back. This season, they start with a more even number of home fixtures, and given their record at BMO Field we could see them lead the competition from start to finish. We believe that 2017 surprise package Atlanta United will actually kick on and become Toronto's biggest threat in 2018. New York City don't appear to be as strong, while Chicago's resurgence may be short lived. Look for the Red Bulls to also stake a claim in the Eastern Conference, but don't expect too many other teams to challenge Toronto. We're looking forward to another potential record-breaking crowd in Atlanta for their big matchup. The Supporter's Shield is again within reach, but one feels that even if Toronto fall short of top position, they will still be more than a threat if they can get into the playoffs - we think they are a certainly to do so. The MLS gets underway in the first week of March - Toronto FC kick off their campaign with a rare home opener, so make sure you get around the best team in the land. All the action begins on Saturday, March 3rd!